If I had been born a mountain girl of the Ozarks, I would know that God didn't love me and that I was being punished for past life mistakes. Shooting and skinning squirrels for dinner, chopping wood, wearing no makeup, living in an unadorned cabin, and stepping outside to view bleakness all around me, sounds like a fate worse than death or jail. 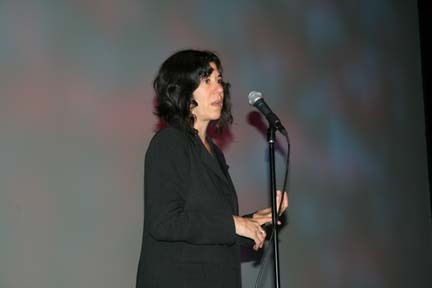 PFS screened the 2010 Sundance Grand Jury Prize winning film, Winter's Bone on Wednesday night as part of the filmadelphiaEXPERIENCE Screenings series, which included a Q&A after the film with Director/Screenwriter, Debra Granik. The film is based on Daniel Woodrell's novel of the same name; Granik and her writing partner, Anne Rosellini eagerly delved into adapting the book into a screenplay and set out to the deep hills of Missouri to film. Which actually only took 24 days to shoot, so perhaps even I could rough it for that long - Nope. Ree Dolly (Jennifer Lawrence) is a 17 year old girl living in the Ozarks solely caring for her two younger siblings and a mother who decided to mentally check out from this harsh existence. The father is a key figure in the film, he's out on bail, having been arrested for "Cooking Crank" aka making crystal meth. His court date is coming up and he's no where to be found; since their cabin and land was put up for collateral, if he doesn't show, they lose everything. The set up sounds like the background to a musical, like Oliver or Les Miserable, and there are times when Ree's odyssey to locate her father is a little too deliberate - traversing the countryside, dealing with "The Law" and distant family members with fierce "gate keeper" mentality; it is a story about perseverance and survival. However, it is in no way melodramatic. It's a solid look at certain realities of life lived in this Ozark culture, and at the same time, it's an engrossing movie. 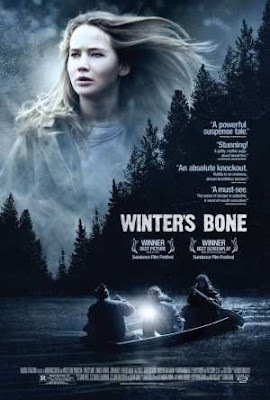 Jennifer Lawrence, who I also really liked in The Burning Plain, (click link to see Tinsel & Tine's The Burning Plain commentary) took on a very challenging role, she's in just about every scene and is so terrific. Q: Were the actors cast from the area? A: The leads were cast on the coast. Then a tier of actors from Missouri, many trained in acting classes from Missouri State University, although none of them were ever in a film before. Then the last section was cast during research and location scouting, "a couple of people just crossed our path and looked so right for certain roles, that we cast them". The children that play Ree's siblings have no prior acting experience. In fact, the little girl was cast because she lived in the house where the film was shot. Originally, the script called for two brothers, but this little girl looked like she came from "this piece of earth". Q: How long was the pre-production period? A: Scouting happened in increments over two years, seven trips. The first was to meet the author, he hooked us up with a few important people, a historian, musicians, a guide who could be the liaison between the film and the community. He was able to knock on doors that we wouldn't have been able to go to directly. The actors, Jen and John Hawkes (who played Teardrop) came down a week ahead of time. Jen had to do a lot of work learning how to use the farm machinery and the squirrel skinning. John visited some bars and got recordings of people's voices in the community to learn accents. "This was a crucial part of the production, to have time before rolling to get acclimated and steeped and immersed in the groove." Q: How was the film received in that part of the country? A: I was there these past four days in the Ozarks. We had four screenings- in the home base where the film was shot, Northern Arkansas and West Plain, which is the author's area. The first screening had a biased audience of people from the area and associated with the film, so they felt very proprietary and proud. The second screening was attended by the head of the Ozarks Studies department at Missouri State. He said the film got a lot right. The question came up about perpetuating a notion that Hill Country people are quicker to violence than other parts of the country. He felt this was statistically not true, but there is a tradition to handle problems outside the law; yet the legends and the lore that have grown up out of this place exceed the actual number of incidents. Granik having spoken about the definition of Hillbilly for the last year, given that she's not one, feels it will be crucial to include in the DVD extras, "27 definitions of Hillbilly" as defined by anyone who identify themselves as one. To have people from this area put words to this term, verses the history of defining it from the outside. "At what point do you retire the Hatfield's and the McCoys?" Q: Did you have any connection to Ozark culture before reading the story? A: "I did not have a relationship or connection or understanding of Ozark culture. Southern Missouri was not a place I had been to or knew about in any significant way. I think what drew me to the story is the character of Ree Dolly. I was very drawn in by this female protagonist, cared about her very quickly, cared about her struggles and her interests and aspirations. I was very curious about her. Ultimately, I wanted to see her prevail and wanted to know how she would do that and the book kept me in suspense about that. How would she get to this place where she'd be able to make a difference in her family's life and maybe stop something, stop a cycle that was ongoing in her family." Q: What else have you directed? A: I did a film prior to this call Down to the Bone, starring Vera Farmiga , so the word bone does keep popping up. If we do another one, it will be the Osteo trilogy.